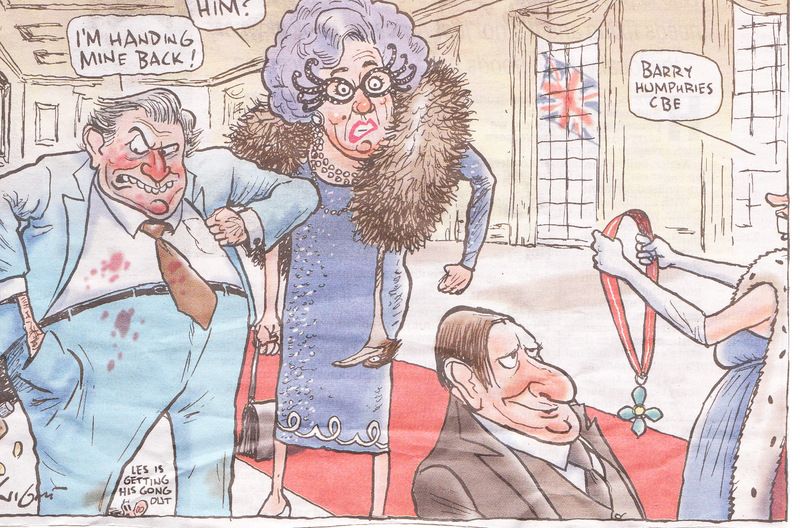 Barry Humphries talks to The Guardian about the music of the Weimar Republic, Dame Edna and Sir Les does get more than a passing mention. 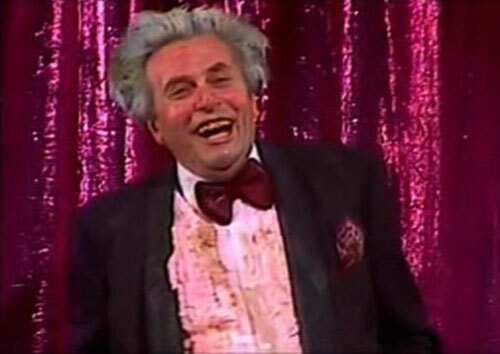 Humphries says none of his characters give him quite as much pleasure as Australian ambassador Sir Les, best known for his puce cheeks, huge appendage and formidable frothing. “I enjoy playing Les more than any other character because it release my inner vulgarity. 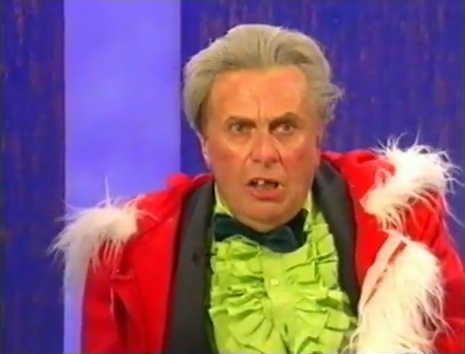 It liberates my repressed ribaldry.” In 1999, Sir Les appeared with Kylie Minogue at Nick Cave’s Meltdown, in a duet that concluded with him chasing her round the stage and whipping out his famous (and thankfully fake) “frightener”. 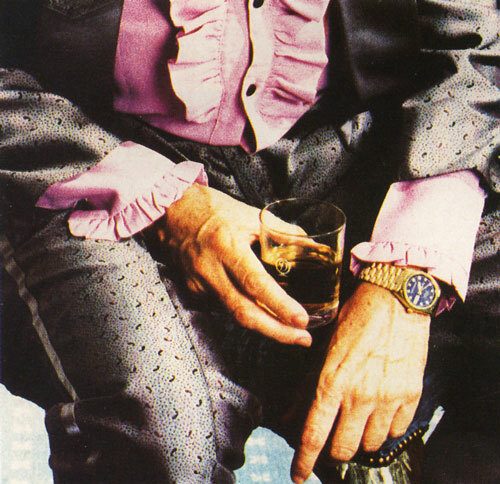 Sir Les is an acquired taste. 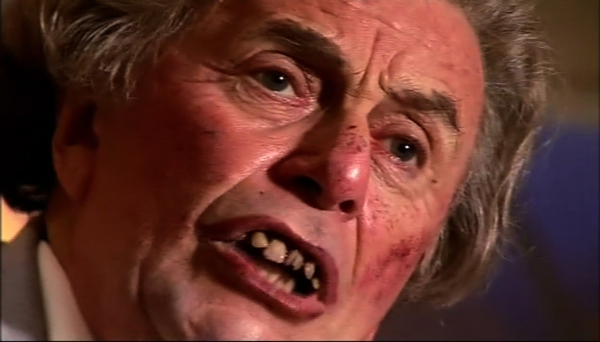 Does he still have sufficient saliva to play the dissolute ambassador? “Well, look, the same question was asked by Prince Charles.” Like Edna, Humphries is an accomplished name-dropper. “He said: ‘Do you have some kind of tube running down your mouth?’ and I said: ‘No, I produce it myself.’ It really is organic. I can expectorate six rows into the stalls.” He looks at me with undisguised pride. “That is an accomplishment, isn’t it? I can almost hit a target half a block away!” Does the royal family like Sir Les? “Prince Charles likes Les a lot,” he whispers lubriciously. Finally reviews of the Eat Pray Laugh! tour have started to dribble in. 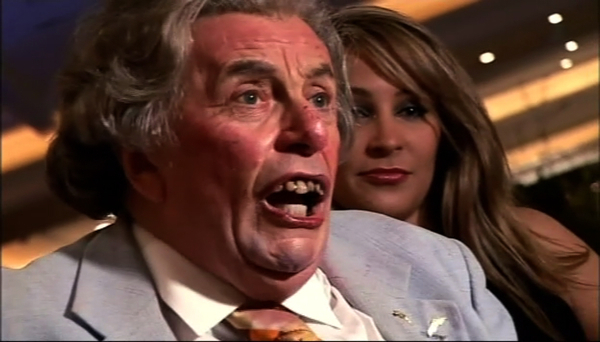 The shows opens with Sir Les Patterson, undaunted by chronic diarrhoea, conducting a celebrity cooking segment in his backyard. 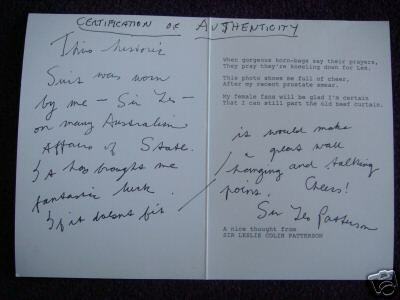 He’s as uproarious and politically incorrect as ever: the trouser-snake, the creamy saliva, the demented overbite, and the unabashed political incorrectness; this supreme incarnation of all that’s dire about the Australian male hasn’t changed a whit. And the packed auditorium went wild for it. 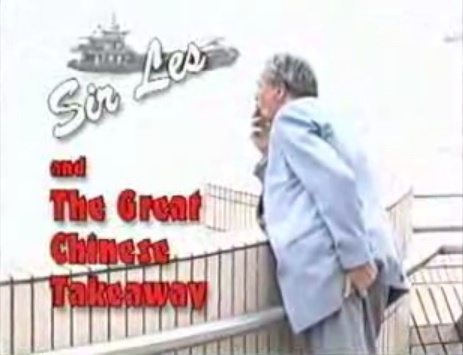 When it premiered in Sydney two weeks ago, Sir Les had returned from the Mexico City G20 Summit with an upset stomach (“Montezuma’s revenge”) and an ambition to become a celebrity chef. “Since when did diarrhoea interfere with gourmet cooking?” he croaks, his dribble sizzling on the barbecue with his rissoles. 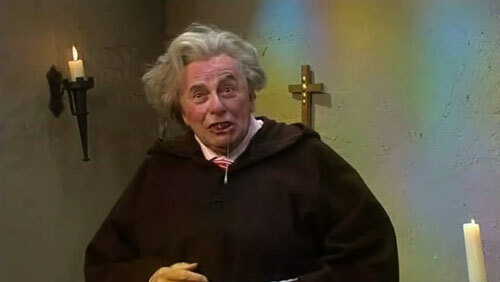 Alas there are no photos of Les’s brother Father Gerard, the Catholic priest who has “touched everyone he has ever met”. I’d wager that Gerard has the same rugged good looks of his former diplomat, now celebrity chef, brother Les. Another clip of Sir Les on Parkinson has been uploaded to YouTube. This time Sir Les is in a festive mood with fellow guests Martine McCutcheon, Tom Jones and Alistair McGowan. It appears that only Sir Les was appropriately dressed for the season. As usual Sir Les is full of facts gleaned from years in the diplomatic community. Who would have known that Astrid was Scandinavian for astride! But it’s Lady Gwen who becomes the main topic of conversation. She’s nice but she’s boring. She could bore the arse-hole in a wooden horse my wife. I mean that lovingly. It’s only when Parky is winding things up that Martine glances over at our hero and cops an eyeful of his trouser snake. Are you with me? Tom’s got a bit of competition tonight. 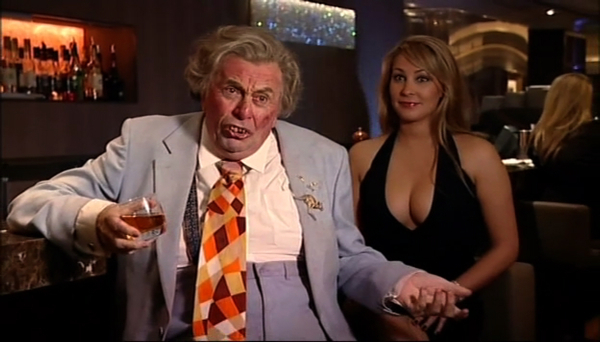 Yes, ‘Entertainment’ is the word on most of Sir Les Patterson’s cheque stubs. 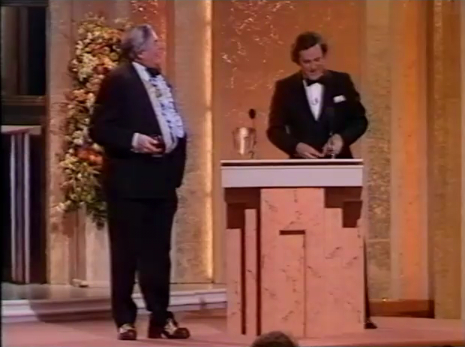 This is according to the man himself, announcing the 1984 BAFTA for Best Comedy Series, live from the Grosvenor Hotel in London. 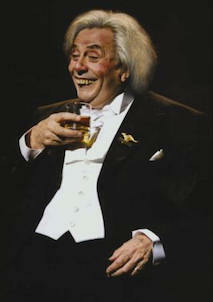 Sir Les kept the celebrity audience entertained by telling a historic joke that had never been told in mixed company before. Thankfully it was suitable for primetime and concerned a little old lady in King’s Cross and three Australian drag queens. Good old Terry ‘Woges’ Wogan managed to keep it together even when Sir Les announced that he was going to ‘open something up and whip something out’. That would be the winner of the BAFTA for Best Comedy Series, Paul Jackson for The Young Ones. I’ve got a bit of a cold tonight so if I cough, put your hands over your mouths will you. According to the BAFTA Awards Database is appears to be 1984 and not 1985 as titled by BlocksVideos on YouTube. 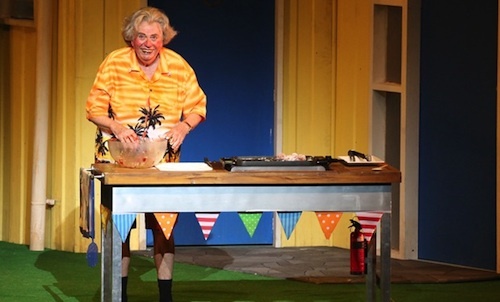 Sir Les and Dame Edna will be touring venues in England, Scotland and Wales this autumn in a show billed as the Last Night Of The Poms. Sir Les was conspicuous by his absence at the shows in San Francisco earlier this year. But now that President Barack Obama is safely in office he can resume his duties providing intimate lectures to arena audiences. Carl Davis CBE will also be present to conduct the band. Be warned that venues will not supply water-proofs to attendees in the first 4 rows during the lecture. Latest reports suggest that the more fanatic Sir Les followers, known as ‘The Diplomats’, have already started camping outside venues 24 hours before tickets officially go on sale. But that maybe a lie. 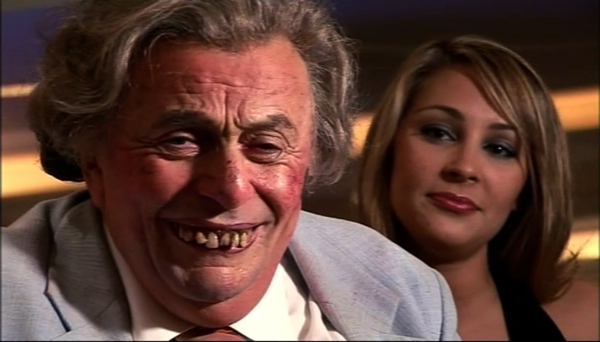 There will, however, be the introduction to an American audience, for the very first time, of Sir Les Patterson. He’s a character that’s been in my repertoire for a long time. He’s a very overweight - or, as you say in the States, “heavyset” - gross Australian politician in a stained powder-blue suit, deeply stained tie, always carrying a drink, who’s now the Australian ambassador to the States. This will be an experiment to see how people take it, because he’s such a contrast to Edna. He’s very good for political comment. That’s Barry Humphries describing Sir Les to the San Francisco Chronicle. It appears that Sir Les has become the Australian ambassador to the United States of America. No doubt he’ll be involved in high-level talks with President-elect Barack Obama. Our new Prime Minister, Kevin Rudd (the dentist), has had as many overseas trips at the taxpayers' expense as I have. Unlike a couple of his predecessors, he has not sought my advice about discreet rub-and-tug shops in Bangkok, though I would have been delighted to assist him should he be desirous of getting his rocket polished in a tasteful setting. He needs to watch his back, however, because Malcolm Turnbull - the next prime minister, incidentally - is waiting for the first opportunity to shaft him. Malcolm, like me, comes from a good old Irish-Australian background, but he once gave me a serve in the British press, accusing me of damaging Australia’s overseas image. I didn’t give a stuff because, quite frankly, I am Australia’s overseas image. But I had to hand it to old Mal. If you’re a nonentity, as he was at the time, the best way to get a bit of publicity is to impugn the patriotism of a bloke everyone knows and loves. I felt like shaking his hand, though my hand was pretty busy at the time. Are you with me? The UK’s Channel 4 will screen a new documentary called Barry Humphries: Behind The Make-Up next month according to The Sun. A camera crew will follow Barry as he returns to his Australian roots including the streets where he grew up and the school he attended. 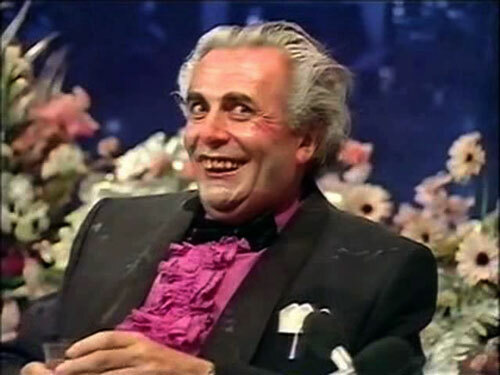 A C4 spokeswoman said: “He’s a comic genius who has produced some of the most enduring characters of the past 50 years such as Dame Edna and Sir Les Patterson. “The programme investigates how he has turned unadulterated vulgarity, snobbery and pretension into comedy gold. 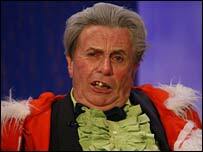 You will know doubt recall that Sir Les starred in a McDonald’s advert that was shown during the 2000 Sydney Olympics. 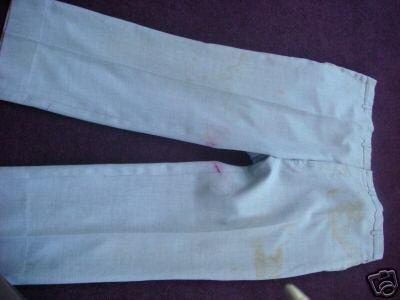 Well the actual suit that he wore for the advert is up for sale on eBay. 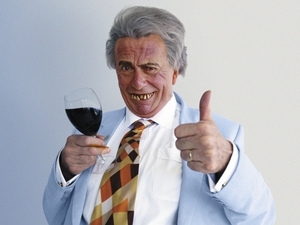 Genuine suit worn by Barry Humphries to promote Mcdonalds campaign, in the 2000 Sydney Olympics. 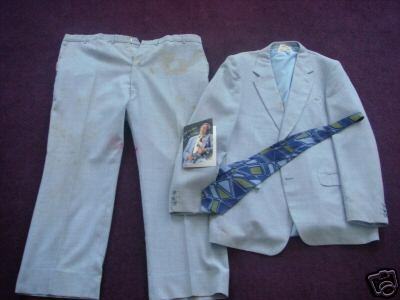 Items include : Jacket complete with “Sir Les” Mayo dribble, trousers and tie. 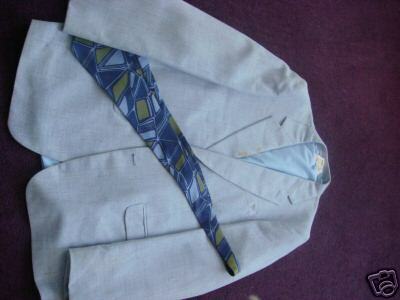 Of course what the description fails to mention is that it has been handcrafted from the finest Australian polyester. It’s also fair to assume that it’s a ‘large’ size. The starting price is £299.99 and it has a reserve so don’t all bid at once. A new media page has been added. This has the A Late Lunch with Les television programme and also the new Health & Lifestyle Around the World segments from The Dame Edna Treatment shows. Before you ask, no Sir Les has not lost a lot of weight, the show is broadcast in the 16:9 widescreen ratio and YouTube only use the standard 4:3. Times Online talks to Dame Edna about The Dame Edna Treatment, which airs on ITV1 in the UK tonight. She says that only “real stars” will be invited and that her greatest achievement to-date is the creation of the Prostate Olympics. 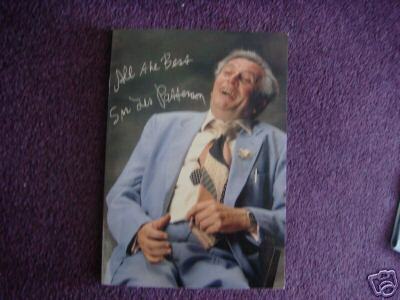 Sir Les gets a brief mention somewhere. Dame Edna gives an interview with TV Times magazine talking about her new show The Dame Edna Treatment. The show airs on ITV1 in the UK on Saturday at 9.40pm (repeated Monday at 11.00pm). Dame Edna will interview guests as they are receiving beauty treatments in her own health spa. The spa has been setup to help her dysfunctional daughter, Valmai, who will act has Dame Edna’s helper after Madge retired. Sir Les also makes an appearance, offering his own lifestyle advice.